I am astounded at how many people roll out of bed every day, every week, every month, and every year to work for a company that is subpar in its treatment of its most important asset—people. There is no spark of enthusiasm when the alarm goes off on Monday morning. Why not? Perhaps it’s time for a career audit. You may discover that your job is a liability instead of an asset. The University of Phoenix (one of the largest online accredited colleges for working adults) invited me to give the commencement address to an audience of 10,000 people in Atlanta, Georgia. I shared with them that some people graduate from college and settle for a cubicle, a check, and a cup of coffee, only to wake up 20–30 years later to realize that the whole world has shifted. Then there are those who hop from job to job looking to find a fit. Do you know anyone like this? Here’s the deal: you were never created to work a job. You were created to find your universal assignment, also known as your life’s work! A job is what you are paid to do. 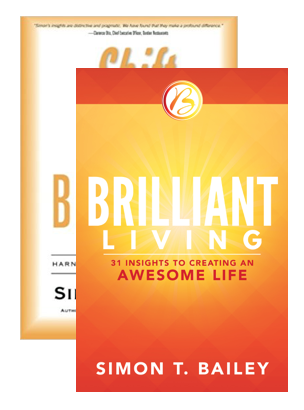 Releasing Your Brilliance is what you are made to do. When you find your life’s work, you will automatically position yourself to become the czar of your field, industry, and marketplace. According to Dictionary.com, a czar is defined as “any person exercising great authority or power in a particular field.” That’s right, I am telling you that it’s time to become the dominant force in your life’s work. This current economy is flushing out bad attitudes, lackluster performance, and half-brilliant contributions. I know what you are thinking: How do I find my life’s work? It starts with an honest assessment of the meaning of your life. Identify one person you work with who is passionate about their life’s work. Take them to lunch and buy them a meal. Ask them when they knew that they truly were making a life instead of a living. Ask them what steps they took in order to shift gears and pursue being brilliant. In every organization, 80 percent of the results are generated by 20 percent of the team members. Who are the 20 percent in your organization, industry, or marketplace? If that is not you, then who? How do they think? What do they read? Who are their mentors? What do they listen to? Invest in a copy of Thank God It’s Monday: How to Create a Workplace You and Your Customers Love by Roxanne Emmerich. This books is a transformational manifesto that will shift your place of business.